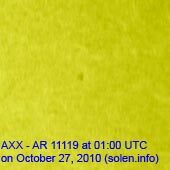 Last major update issued on October 27, 2010 at 03:40 UTC. The geomagnetic field was quiet to unsettled on October 26. Solar wind speed ranged between 495 and 640 km/s, under the influence of a high speed stream from CH426. 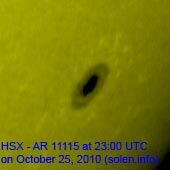 Solar flux measured at 20h UTC on 2.8 GHz was 86.1 (down 4.6 over the last solar rotation). The planetary A index was 8 (STAR Ap - based on the mean of three hour interval ap indices: 7.6). Three hour interval K indices: 32221222 (planetary), 32331221 (Boulder). 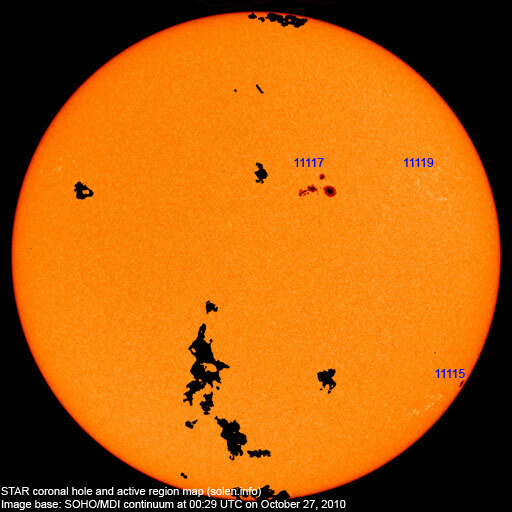 Region 11115 was quiet and stable and is rotating over the southwest limb. Region 11117 saw lots of changes during the day. 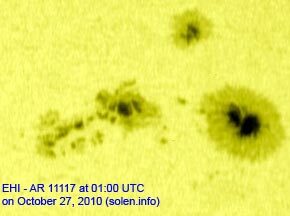 A large spot east of the leader spot developed quickly and moved fast westwards eventually merging with the leader spot and forming a large symmetrical penumbra. A large spot formed in the western part of the trailing spot section. Magnetically the region appears to be a little less complex than it was a day ago, however, there is still a chance of an M class flare. 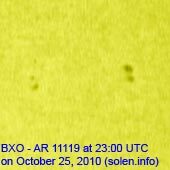 Flare: C1.1 at 01:13 UTC. 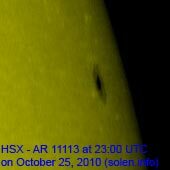 Region 11119 developed early in the day, then decayed and coudl soon become spotless. 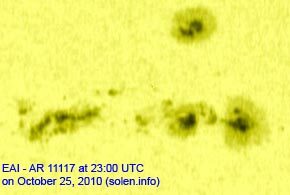 Flare: C1.0 at 08:14 UTC. October 24-25: No obviously Earth directed CMEs were seen in LASCO or STEREO images. 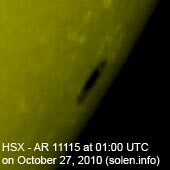 October 26: A CME was observed starting at about 09h UTC following activity near region 11115. Although the CME will likely not reach Earth, there's a chance of a glancing blow. 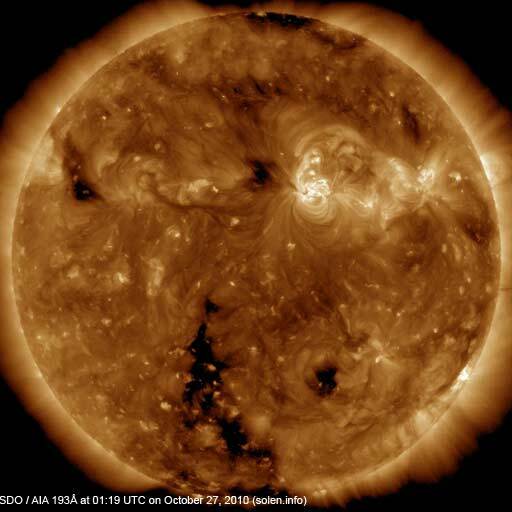 The geomagnetic field is expected to be quiet on October 27-28. On October 29 there's a slight chance of unsettled intervals should the CME observed on October 26 reach Earth.